The 2019 World Championship Snowmobile Hill Climb. 43rd Annual Hill Climb March 21 - 24th. 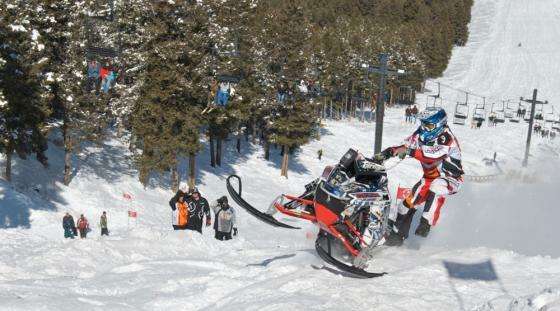 Don't miss the 43nd annual World Championship Snowmobile Hill Climb on March 21nd through the 24th. The Jackson Hole Snow Devils host this exciting event at Snow King Mountain Resort, which promises to be one of the best yet! Watch as snowmobilers and their machines struggle to get up the 1500 ft. vertical rise mountain. Not all of the racers make it, which provides lively entertainment as snowmobiles come tumbling back down. Visit the concession stands and snowmbile brands based at the bottom of the mountain for food, drinks, and a glimpse of the latest snowmobile gear and technology. Call Jackson Hole Central Reservations at (888) 838-6606 to book your Hill Climb lodging today. This is a popular event, so don't wait. Our friendly travel experts can also help answer questions about transportation and fun things to do while you're in town. Take a scenic chairlift ride to enjoy views of the entire Teton Range and Jackson Hole Valley. This four-day pass will give you unlimited access to the scenic chairlift. Ride to the top of Snow King's summit so you can experience all the excitement of Hill Climb from above. Click here to purchase.